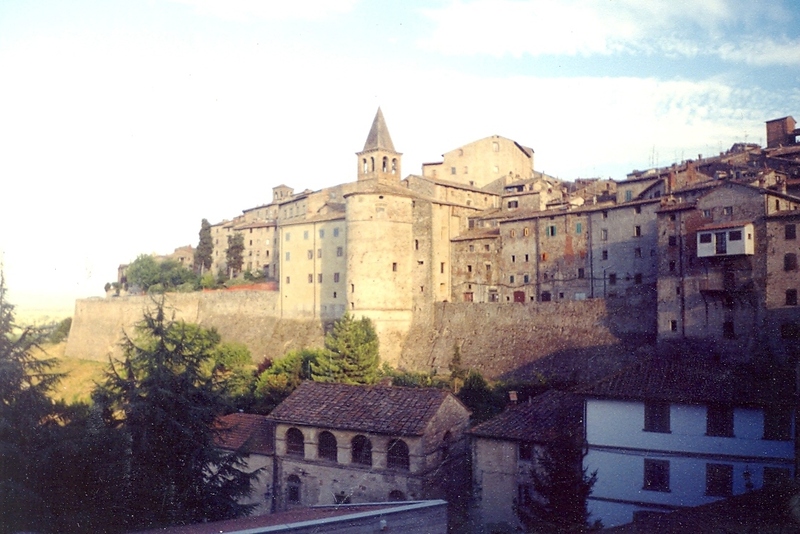 Anghiari, Italy is picture-perfect. The ancient, sleepy city rests on a hill in Tuscany, with narrow, winding stone roads tightly wrapped within a mighty wall dating to the thirteenth century. Each day, the Tuscan sun bathes Anghiari’s many taupe and tan bricks with an amber light so warm that it tugs sunflowers from the ground and causes olives to ripen into perfection. Each night, the people of Anghiari gather to dine, al fresco, at tables spread with salty cheeses, Neapolitan-style pizzas, and carafes of house wines—usually a nice Chianti. Even Julia Roberts could not have eaten, prayed or loved in a more exquisitely beautiful location. 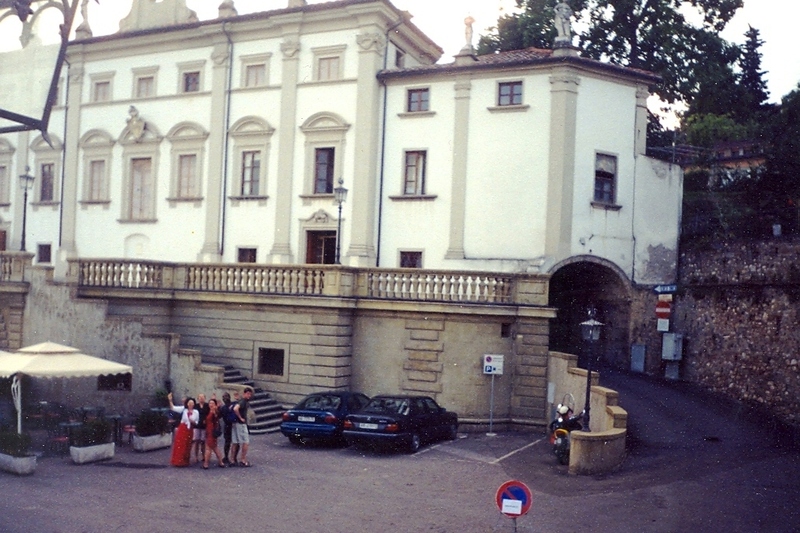 The Fates once invited me to spend a summer in Anghiari, and I accepted. At a Fulbright Scholar conference in Berlin about a decade ago, I was introduced to an impresario of sorts, who needed a baritone and costume designer for his summer opera program. Since my partner Brian could handily fill both roles, the offer was too good to refuse. I was nearing the end of my Fulbright year in Dresden, Germany, and my tasks consisted of translating microcassettes (remember those?) of interviews with former choir directors from the German Democratic Republic. I could just as easily accomplish those tasks in sunny Italia as in Germany, I reasoned. Thus, I packed my things, Brian began learning a Cimarosa opera from a chicken-scratched score, and we resolved to spend our summer together in paradise. Having lived from a government stipend for the previous year, I was near destitute, and I required a plan to stretch my remaining dollars, Deutschmark, and lira throughout the reminder of the summer. The singers in the opera program were held to a tight rehearsal schedule and had limited time to prepare and consume their evening meal. As it happens, I love to cook and had ample unstructured time in my days. Thus I became the chef for an opera cast, providing a daily, homemade meal for sixteen singers—which, in turn, allowed me to eat for free. With this arrangement, my role shifted from tourist to resident, as my daily routine suddenly included the stuff of ordinary people: cooking, cleaning, grocery shopping, laundry, and so forth. On a typical day, I dedicated my mornings to my Fulbright translations. I had a favorite work location—a small cafe with a modest selection of pastries and an espresso bar that hissed, banged, and whirred incessantly as it produced tiny cups of rich black coffee. I caffeinated myself heavily as I typed translations on my tangerine MacBook. Shortly before noon, I packed up my belongings and stopped at a grocer for a few necessities for open sandwiches with Brian—perhaps some new cheese, olives, or cucumbers to accompany the fat loaves of unsalted Tuscan bread. We dined together and enjoyed a post-prandial siesta (which still causes me to wonder why everyone doesn’t nap in the middle of the day). Once I awoke, dinner preparations began. Each day, I needed produce…beans…cheeses…and bread to sop up the delicious locally made olive oil. The markets brimmed with giant, purple eggplants; squash blossoms; bell peppers as red as a stop sign; zucchini, so delicate and flavorful; and tomatoes so sweet and juicy that they actually seemed appropriately classified as fruit, like my elementary teacher told me they were supposed to be. Of course, there were linguistic challenges. Coming on the heels of a year speaking German in Saxony, the pure-voweled, consonant-meager words of Italian were a struggle. I possessed the Italian competency that I could cobble together from a few lessons and some half-hearted self-study. I won’t even go into the vocabulary trials that I faced when circumstances necessitated a trip to the hardware store. Mercifully, however, my culinary tasks required only a command of nouns, but few verbs and little conjugation. I needed a kilo of this, half a kilo of that, and 200g of cheese. In Germany, anyone exhibiting my linguistic fumblings would be ridiculed and certainly unable to haggle with shopkeepers. Yet, in Italy, people seem to have infinite patience for those who try; thus, the shopkeepers waited happily while I stuttered out my daily shopping lists. After achieving miniature grammatical victories with the produce lady, the grocer, and the cheesemonger, I proceeded to the apartment where I prepared dinner. The kitchen was microscopic, with four small burners, no oven, and just enough counter space for a single cutting board or a mixing bowl. Yet, there I daily prepared a multi-course meal for sixteen. The ingredients are so fresh and delicious that it is easy to cook, even with limited resources. Had I channeled my grandmother and boiled all the ingredients together in a pot until they became a homogenous, brown goo, it still would have been bursting with flavor. That’s Italy. Time has a way of coloring the past with a haze of a quiet joy. Perhaps, in reality, my dinners were less than perfect. However, as I remember them, looking back a decade, I see a table bedecked with platters and surrounded by happy singers who laughed together and toasted one another as they dined family-style each evening. 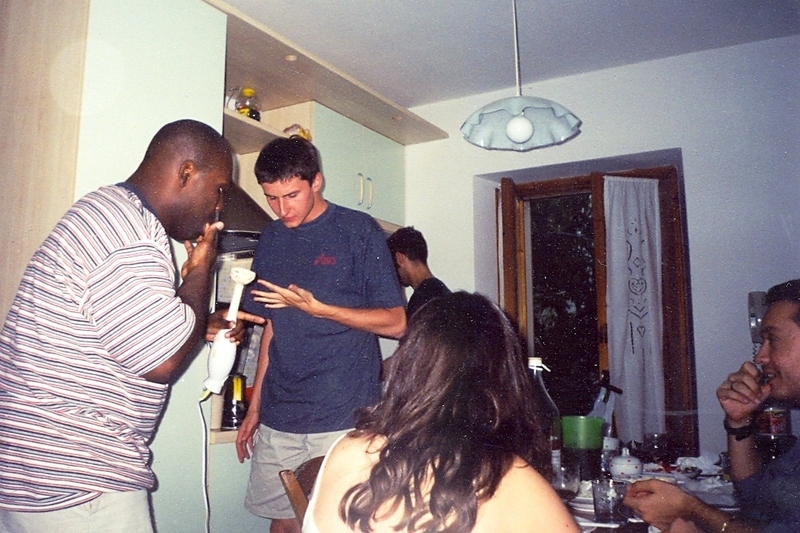 I remember merry times with an international, musical family. I remember thinking that everyone’s life should be so filled with such love, community, and purpose. And in the evenings, when the singers resumed their rehearsal, I cleaned the dishes and restored the kitchen to its formerly tidy state. And then, having completed my tasks for the day, with nothing else to do, I put the mocha pot on the burner and made espresso. I put my feet up and sipped on the balcony while contemplating how rich and full my life had become. I surveyed the ancient walls that had gathered and embraced the people of Anghiari for centuries, then watched the bats fly overhead as the amber, Tuscan sun faded behind the mountains. from → Cultural Background, Not All About Music!